Home › Blog › Oppositional Defiant Disorder › Why Will My Daughter Listen to You? 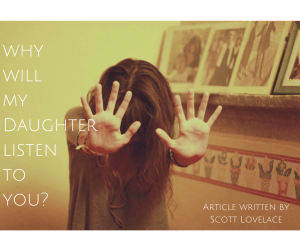 Why Will My Daughter Listen to You? The first time we meet parents we often times hear the statement, “My child has put up walls. She won’t listen to me. She won’t listen to her therapists or her teachers, not anyone.” This question always follows, “If I enroll my daughter into New Haven, why will she listen to you?” This is a completely understandable question. If parents feel that nothing has worked in the past, what makes us so confident that what we do will be any different than the other attempts? Let’s talk about how breaking down barriers and quickly building relationships at New Haven. It is important to understand that parents don’t come to us emotionally healthy. They, themselves, are struggling with Post Traumatic Stress Disorder. It is not easy to watch your child make dangerous choices. It is not easy to see your children self-harming and doing destructive things to themselves. Parents oftentimes respond to their children out of fear. That fear comes across as anger. Privileges are withdrawn. Teens think their parents are being mean when what they are really saying is, “You can’t go out or do anything because I am afraid.” Soon, it becomes a power struggle and often they will shut themselves out of their daughter’s life. It is no wonder there are communication barriers. We work to heal not only the daughter but the whole family. Those barriers start to come down as the girls come to the program. They are greeted by the clinical director, the house lead, mentors, nurses, cooks, and the other girls. They hear the other girls talk about how long they have been at the program and how they love the people they work with. Young ladies who have been with us for a longer period of time are really good at helping your daughter realize that she will really grow to love and trust the staff at New Haven. This chips away at some of those barriers. There are five love languages. (Words of Affirmation, Quality Time, Service, Receiving Gifts, and Physical Touch-such as a hug or an arm around their shoulder) We try to communicate with them through their own love languages. They might respond better to “quality time” rather than “words of affirmation.” If that is the case, we look to find ways to help them communicate by spending time with them. (It is not uncommon to see one of the therapists playing a card game with a student or shooting some hoops while they talk). We do this rather than complimenting them, which might make them feel uncomfortable. Emotional safety is different for everyone. We make it a point to always be open, vulnerable, and non-judgmental with the girls as we try to communicate with them. Sometimes they can be shut off for months. This is especially the case when they have had shut off relationships with authority figures in the past. We keep coming to the girls to help them open up. Sometimes they get tired of the questions and begin to yell or swear at us, but we remain calm. We talk to them about how we don’t take it personally, and that they must be badly hurting. We talk to them about the pain they are feeling and how it affects relationships. We really try to use this time to get past the conflict level of communication. It is not uncommon to hear the girls say, “No one listens.” I personally like to tell them, “I am not going to say anything, tell me about your life. Tell me about your inner child, what do you like to do?” Then I like to go out and do those things with them. Often times we will take them for a walk around campus or visit them at school. Therapy doesn’t have to consist of four walls, a couch, and a therapist. “What do you feel is the most effective way for us to encourage you?” This helps the girls communicate more effectively. Letting our clients know that they can make decisions to better improve their situation is liberating and affective. We also like to ask the girls, “Would you like to know anything about me?” Part of being a successful therapist is being open. We will share personal experiences as we feel it is necessary. The girls need to realize that we can share our experiences as well. I, personally, am quite open with my clients. We have a relationship based program. We work to get to know the girls, process with them, and be their friends. Even when the girls are upset we remind them that they are loved, that they can do hard things, and together we will get through this. We work as a collaborative team. We all have the same vision to help them make peace with their past, thrive in the present, and create a hopeful future with their families. These wonderful girls don’t need to carry all of the pain of their past. They need to know that they can drop it off and let other people help carry their burdens. As we work on this we develop a love for the girls and their families. To us, the day our young ladies transition is one of the saddest most difficult times because we truly develop love for the girls and their families. Therapists can communicate openly with the girls, and the girls can communicate openly with their parents. By the time they transition, they will have listened and healed.